Boomerang Bags in Paihia, watch out, they return in two weeks! As newbie volunteers my niece Connie and I were a little apprehensive. Why? Because with our sewing paraphernalia tucked under our arms we were on our way to the 35 Degrees South restaurant on the sunny Paihia waterfront. This was the venue for making Boomerang Bags, a charity set up in Australia and now over here, which involves making shopping bags from recycled material to replace plastic carriers. It sounded great but, really, what had we let ourselves in for? We'd have to speak to people we didn't know, would our novice needlework skills be given scant regard? Brave faces on, we giggled that we were off to save the planet (a side effect of volunteering!!) with a pillowcase, scissors, pins and a sewing machine. Sarah Greener, the organiser, greeted us and filled us in on the tasks. Although it was only just past 9.00 am there were already lots of busy people cutting out fabrics, pinning, sewing, ironing and screen printing. I was actually amazed. Connie and I set ourselves up on the cutting out table. Boxes galore of gorgeous fabrics had been donated by a local curtain making company, a huge array of t shirts, vests, pillow cases and other recycled fabrics had all been generously given by local people and charity shops. We enjoyed choosing material for bags we thought we would like, then sensibly realised it wasn't about us, it was about making as many as possible. Sarah told us that the Paihia FourSquare used at least 300 plastic bags a day. Boomerang Bags had a mission. 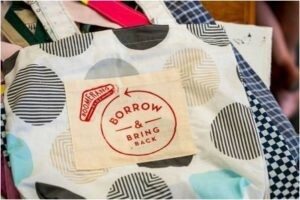 Get people to use a fabric bag to take home their shopping, then return it to the shop on their next trip in so others could use it. We were too busy to be nervous now, we were part of a team generating a real buzz. Sarah, and her family, had kindly provided coffee and muffins (yumski btw), and I joked that we were working in the most beautiful sweat shop in the world. Seriously, have you seen the view from 35 Degrees South? Sun was pouring in through the windows. The bay was at its best. If a unicorn had flown overhead it couldn't have been any better! About 12.00 people began to drift off as the restaurant was filling up. It had been a very productive morning, many bags made and many volunteers took some home to finish them. Thanks to 35 Degrees South's incredible venue and Sarah's excellent organisational skills Connie and I had a brilliant introduction to volunteering and although the planet isn't quite saved yet Boomerang Bags is certainly raising awareness and doing something about it. I'll be back next time, hope to see you there too.